The yacht was one of many participating in the Fastnet Race in rough seas off west Cork this morning. THE COURTMACSHERRY RNLI was called to assist a yacht that got into difficulty in the early hours this morning. Participating in the Fastnet Race, the 40ft yacht had suffered a broken mast which put the 10 people on board in danger. The RNLI’s all-weather lifeboat was called to attend the scene 20km off Galley Head in west Cork just after 3.20am this morning. A crew of eight volunteers managed to find the location of the yacht amid the darkness at around 4.45am. The RNLI crew secured a towline to the yacht in order to stabilise it, and has now proceeded to tow it at a slow pace back to Courtmacsherry inner harbour. All of the 10 people onboard the racing yacht are said to be in good condition. They were expected to reach the harbour at around 8.30am this morning. The Courtmacsherry RNLI said that the conditions at sea this morning were tricky, with north-west winds blowing with a force 3/4. This yacht was participating in the Fastnet Race, and was one of a whole fleet of yachts approaching the turn at Fastnet Rock, which is around 6km southwest of Cape Clear Island. 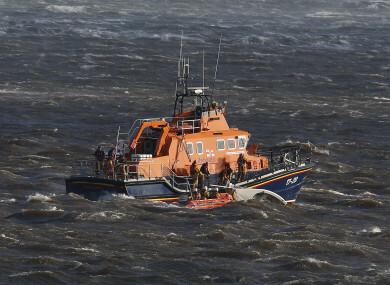 Email “RNLI rescues 10 people after the mast broke off their racing yacht early this morning”. Feedback on “RNLI rescues 10 people after the mast broke off their racing yacht early this morning”.